Humans have consumed chocolate for more than 2000 years. It was first discovered by the ancient peoples of Mexico and Central America, where the cacao (cocoa) tree grew in the local rainforests. They mixed the pods of the cacao tree with water and other seasonings to make a delicious, spicy chocolaty drink called 'chocolatl'. The Maya people of the area harvested cacao beans from trees that grew wild in the rain forest, and went on to farm them in what became the first known cocoa plantations.Later on, Spanish conquistadors took the seeds of the cacao tree to Spain. The popularity of drinking chocolate soon spread throughout Europe and variations were developed, altering its texture and flavour. In the early Victorian era, a technique was devised to make chocolate solid. From then its popularity as a confectionary soared. Cacao trees originally grew wild in the tropical rain forests of the Amazon basin and other tropical areas in Central and South America. 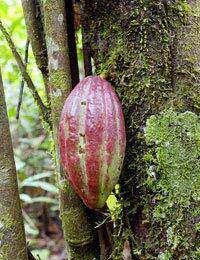 As well as using the seedpods of the tree to make a spicy chocolaty drink, they also used them as a currency. Cacao beans were often given as gifts and used at religious ceremonies. The Maya people had many gods; one of them, Ek Chuah (the merchant god), was linked with cacao and was honoured in festivals with an abundance of cacao fruits. Merchants of the Maya people often traded cacao beans for other commodities, and for cloth and jade. Farmers usually transported the beans to market by canoe or in large baskets strapped to their backs. Wealthy merchants travelled far and wide to sell cacao and introduced the cacao seeds to Aztec people of Mexico. In 1517 Don Cortes set sail from Cuba and invaded Mexico. There he discovered his favourite drink, 'chocolatl'. Within three years, Cortes had defeated and killed off the Aztecs and in 1528 he returned to Spain. With him, he took cacao beans and equipment for making the chocolate drink. It wasn’t long before the Spanish were enjoying the delicious drink, however it took nearly 100 years for its popularity to spread across Europe because the Spanish were vary secretive of this exquisite recipe. Because cacao trees need certain climatic conditions in order to thrive, plantations were set up in the West Indies, the Far East and Africa. Greater quantities of cocoa subsequently came onto the market and its price began to fall, enabling it to become a drink enjoyed by the masses. What’s more, the Industrial Revolution made it easier to transport cocoa across the world. Because of this newfound accessibility to cocoa, apothecaries (chemists) started to look into different ways to consume chocolate (it was also thought chocolate had medicinal values). It is unclear, precisely when chocolate was first made available as an edible confectionary. In 1847, Fry & Sons of Bristol, sold a 'chocolate delicieux a manger', which by today’s standards, was not very tasty. Chocolate has an exciting and varied history across the world. It has been enjoyed by many over the years in hundreds of forms and is still loved today. We now have the luxury of having thousands of types of chocolate to choose from, including drinking chocolate, chocolate spread, and the many types of delicious chocolate bar.